Our elders in Hospice spoke about their traditional Ashoura days in past, neighbourhood when they were children and took us to those days. 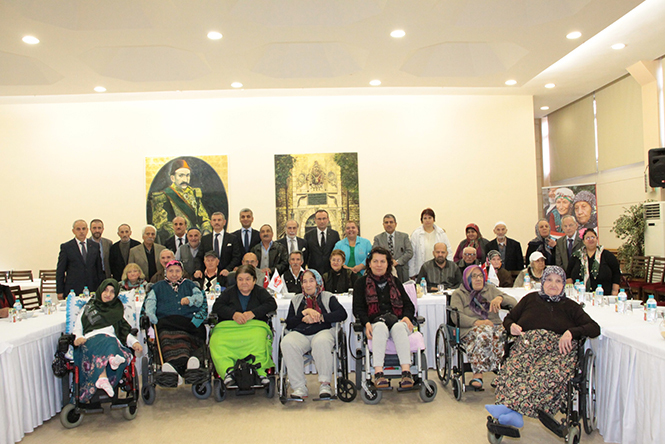 The organization of Ashoura Day at the Ministry Of Family And Social Policies Head of Hospice on the 23rd of October 2015 Friday, with the Hospice President Hamza Cebeci as the host, and the contribution of Reis Gıda; Reis Gıda Chairman of Board Mehmet Reis and the elders living in Hospice attended. Reis Gıda was with our elder people during the muharram ul haram, as it is every year, to let them live the traditional Ashoura days. The 23rd of October Friday was the Ashoura day and the organization that was carried out started with the Koran Chants. Later, our elder people told their memories regarding those days. At the end of the activity, Ashoura was served. Hamza Celebi continued his words with Mento Mehmet Akif’s verse ‘’See the joker creature called civilization. Spit on the masked conscious of the era, spit’’ and later said ‘’As a brother of yours who has done his higher education in Europe, I saw how people were miserable in the streets and how people with no money are neglected. It is not civilization where there are planes in the air, tanks on the ground and guns that are fired. Civilization cares about the life and the manners where people are respectful and sensitive among themselves. Therefore, civilization is 120 year just as the Hospice; it is a mind that helps the people in need that have came to your door without expecting any money and without the discrimination in religion, language, race, sect, spirit and ideology. In a time when human have lost their manners, I thank Reis Gıda that come to Hospice nearly every year and many times a year, asking for any needs,for having a bond of love with the people here. Let God strengthen their power. We always remember the ones that have been helping us during this 120 years with blessing. Let the ones we have lost to rest in peace and the ones who live to live in health, wellness and live long lives’’. The residents of Hospice explained the traditional Ashoura days. 7 water glasses of granulated sugar. Let the wheat come to a boil from one night before with hot water and let it rest till the morning. Boil the Chickpea and dry bean seperately in previously heated pans. Later add the chickpea and fried bean to the wheat. In order, add the rise, pine nuts, dried grapes, diced apples and apricots. Add water until the ingredients are covered and stir while you continue to cook. Finally, add the sugar and orange and lemon peels, mix them. After it is slightly thick, take it from the stove and place it inside bowls. Serve by adding dried apricot, fig, pomegranate, walnut, rosewater, cinnamon on top.Enjoy.